My brother and his girlfriend, Pamela, are pregnant! I'm sure that I have mentioned it before. I am very excited for them and I am excited to have another niece! My mom and I (with some help from my sister, Kema, and friend, Rachelle) recently got baby shower invites out! My momma and I are hosting and I am pretty excited! One of the first things I did was get on Pinterest to find things that I liked. They have it all: from budgets to gifts to favors and decorations to food to games and then some. It is pretty amazing! I found some invitations that I liked, but I didn't want to purchase them, nor did I get into the cheesy-ness of them. As a scrapbooker, I am fairly handy with such things, so my mom and I bought the supplies and we all banded together to make them. Here is the Etsy link because this person did a great job, and I copied the general style: Modern Baby Shower or Sprinkle. Sorry the image is skewed. I blanked out important information that I don't want all over the internet... So I designed the invites and used Word to print two per page. my mom and I picked all of the papers. We got lucky and found a paper punch for clouds! Each invite got two clouds. 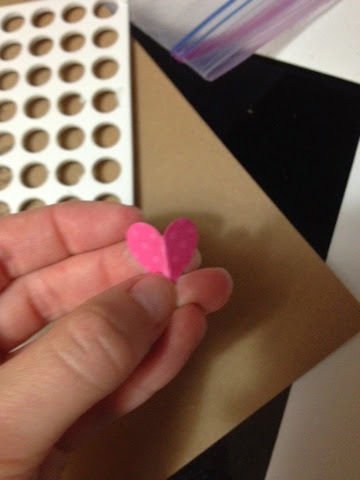 We also found a small heart-shaped hole punch. 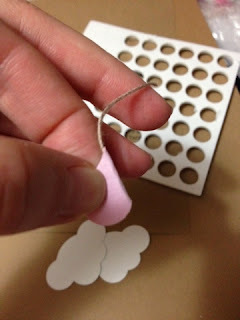 I figured this would be easier to make the rain drops because we could fold them around the string. Like so. 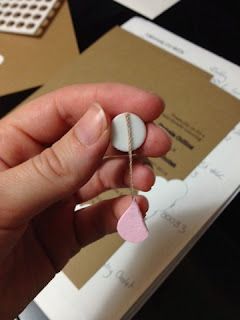 I cut the strings (which matches the background paper pretty well) and we folded and glued the hearts around the string ends. To attach the clouds, we used these double-sided foam stickies. I attached one side to the strings for the raindrops ad then attached the same side to the clouds. The other side was stuck to the invitations. And there you have it! Pretty invitations! We also decided that we liked the "rain" theme and are planning to stick with pink and rain for the party. We ordered the cake from an AWESOME local pastry and cake shop: Das Meyer. They do amazing things! 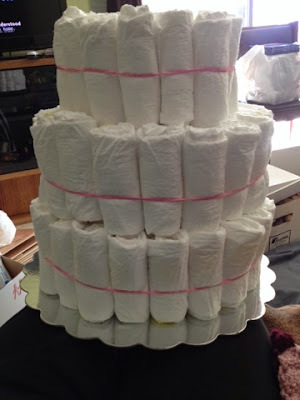 And I cannot wait to see the cake they make for the shower! It also goes with the pink and rain theme. I have a secret Baby Shower board on Pinterest right now. Once the shower is over, I will make it public so people can see what ideas and inspiration we had. I just don't want all of this to get out to Pamela and Arik before the shower--it will ruin all of the surprises. To that end, I will also be waiting to post most of our creative gifts and decorations. I will post the beginning of the diaper cake because everyone knows you have to have a diaper cake, right? It isn't too tall, but it's pretty big around. I got three bags of diapers in here! Around 100 or so diapers. Nice so far! Have to decorate it now! We have some other decorations and gifts ready that just need to be put together and organized. We have most of our game prizes already, but I still need to solidify the games and supplies. My mom and I are going to get table decorations and other miscellaneous things tomorrow. Friday is our cleaning, set up, and maybe some cooking day and then the shower is Saturday! Ahhh! Still so much to do, but I am very excited! And the day after the shower, Isaac and I leave for our vacation! What an exciting week!